Great question! And great point about this being beyond where some bloggers might be at the moment. In fact, we chatted about that concept in my interview for the Neon Noise podcast when host Ken Franzen asked me about republishing blog posts to other sites like Medium and LinkedIn. 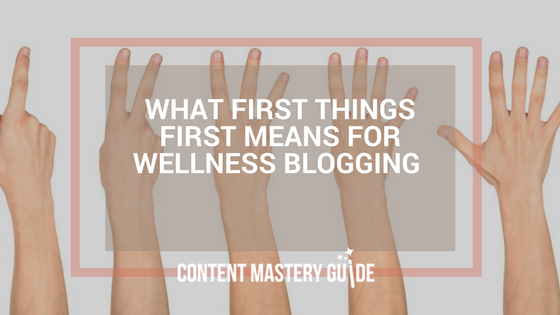 Once you’ve been doing all this consistently for awhile (it will take six months to one year to start the see the real results of your efforts), and you’ve navigated successfully through some rough spots (see: Five Things Not to Do When Restarting Your Business Blog and Is There a Bottleneck in Your Wellness Blogging Process? ), then it’s time to take things to the next level. Just like you plan your blog posts, you can plan when you will republish those posts to other sites. I developed my own republishing plan while taking Denise Wakeman’s 30-day Online Visibility Challenge (you can start here with her free 7-day version). First I reviewed my Google Analytics to determine my most popular posts from the archives. I also knew I wanted to keep republishing my most recent posts. Then, I added all of those posts to a Google Sheets document. I include the URL for quick access later, the original publication date, and when I plan to (or when I actually do) post it to the other site. Once I’ve republished the post, I change the text colour to light grey so I can see at glance which ones are complete. I’ve been experimenting for awhile with publishing new posts twice a month rather than weekly. Sometimes this was a necessity because of competing priorities, but I also realized that I have a gold mine of content in my archives that many readers still haven’t seen. Of course publishing less content only works as long as you’re also promoting your content in between posts, and keeping in touch with your network via email and social media. So while I can’t say I never missed a week, I did my best to maintain my weekly newsletter schedule. On the alternate weeks when I don’t publish a new post at Content Mastery Guide, I will republish a popular or recent post to my LinkedIn blog (twice a month or so), or to Medium (I have two planned for this quarter). So here too, I am focusing on consistency and quality, not quantity. While I do have my topics set and some of my outlines started for my six posts in Q1, I’m also open to scrapping those posts and starting new ones if that’s where my inspiration takes me. As for social media, at the beginning of 2017 I signed up for Edgar, a tool that allows me to store my social media updates (separated into categories), and then cycles through them again and again. As they explain in this comparison of Edgar vs Hootsuite, the lifecycle of a social media update is very short, so resharing allows you to reach more of your audience without having to continually add or produce new content. It’s a premium service, and priced as such, but I can definitely say people have responded to my reshared posts. And those moments of connection simply would not have happened otherwise. That’s ultimately why I decided to renew. So just as I am planning to produce less content but promote it more, I also want to deliver high-quality content that will add value to my readers’ lives and businesses. With 640+ posts and counting here at Content Mastery Guide, I’ve learned a thing or two about what it takes for me to produce my best content. And that is time and space. Ideally, I’ll spend 20 or 30 minutes over a few mornings drafting and writing a post, and then give myself a spacious stretch of two or three hours to shape it to completion. Then, I like to set it aside again so I can approach the final proofread/edit with fresh eyes and run through the remaining steps of the blog writing process. For 2018 Q1 I’m setting up my morning routine to allow for this process, with 30-minute slots scheduled every weekday morning, and a two-hour space on Thursday mornings. When I’m tempted to push blogging to the back burner (yes, it will happen), I’ll remind myself that I only need to keep this schedule for three months. Then I’ll review and decide whether to continue. If you try to do too much, too soon, you’ll put undue pressure on yourself and your blogging team and your writing will stop being fun or effective. Make a blogging plan that suits your creative flow, schedule, and business goals. P.S. Even though I’m sold on Edgar, I still love Hootsuite for viewing my Twitter lists, and Buffer’s web extension for managing my clients’ promotion and for sending the occasional one-off post that I know I won’t want to share again later.